This “Chef of the Future” has no fixed abode and yet he’s a la mode. Pop-up was the word of choice by many in the American food scene when asked to describe what’s hot right now – from Los Angeles to New York it seems there’s no end to the pop-up craze with Ludo Lefebvre as king and his wife and business partner, Krissy Lefebvre as queen. Can’t wait for their TV series Ludo Bites America to come out July 19th at 9pm – is America ready for Ludo?! “Yes Chef!” teaser video at the Sundance Channel. 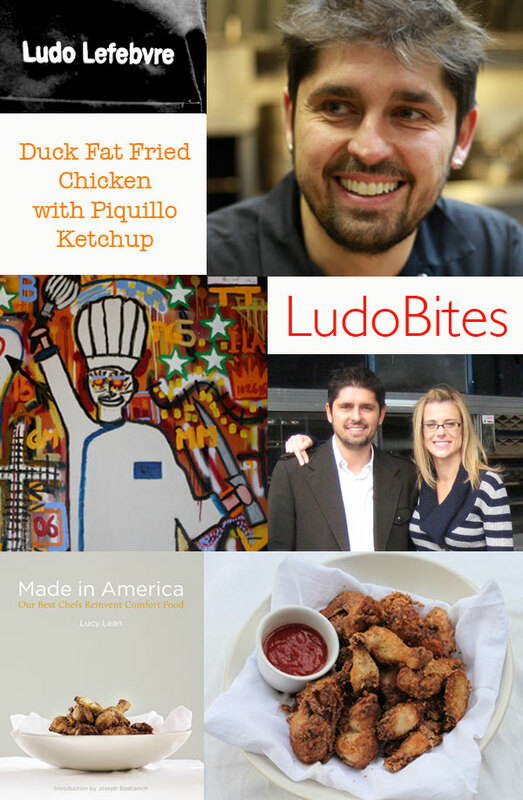 For Made in America I asked Ludo for his fried chicken recipe as a nod to the time we spent together serving his chicken balls to thousands of hopefuls at the LA Street Food festival back in 2010. This has to be the first and only time I will be found on a food truck – but for one day I wore my LudoBites servers t-shirt with pride. Ludo had agreed to take part if he could serve his fried chicken from the bright red truck wrapped in the giant LudoBites rooster logo and Krissy had insisted that I was on the truck as a server. Let’s just say it was a lot of fun but also extremely stressful, hot and I smelt of fried chicken for weeks! At the truck’s launch, hungry fans waited on line for 3 ½ hours for two fried chicken balls with a side of sauce and what they all agreed upon was that it was worth it. Now that Ludo has shared his recipe there will be no need to wait in line – within a short amount of time you can have yourself some Ludo Fried Chicken infused with Asian flavors and served with spicy red Piquillo ketchup. It goes without saying that this is beyond good and we were so excited about this dish we used it for the cover of Made in America. Like so many dishes that we now consider American, fried chicken originated from across the sea. Scottish immigrants to America had a long tradition of frying chicken in lard which they brought with them – as opposed to the English colonists who would spit roast their birds. In the South, African slaves added spices to the flour they would dredge their chicken in. Out of these traditions comes Southern Fried Chicken. Today it is certainly associated with America and when we think of Scotland it’s probably more likely to be oatmeal/porridge, haggis or whiskey. Ludo’s recipe includes Duck Fat not lard and butter – but this recipe from How We Cook in Los Angeles (1894) for Fried Chicken includes similar ingredients – the frying of chicken in Los Angeles hasn’t changed very much in over 100 years. there is something about fried chicken that is so comforting. yet, when ludo makes it, it goes to a completely different level!